Warning: If you want to give these dotfiles a try, you should first fork this repository, review the code, and remove things you dont want or need. Dont blindly use my settings unless you know what that entails. Use at your own risk! If ~/.extra exists, it will be sourced along with the other files. You can use this to add a few custom commands without the need to fork this entire repository, or to add commands you dont want to commit to a public repository. You could also use ~/.extra to override settings, functions and aliases from my dotfiles repository. Its probably better to fork this repository instead, though. Some of the functionality of these dotfiles depends on formulae installed by brew.sh. If you dont plan to run brew.sh, you should look carefully through the script and manually install any particularly important ones. 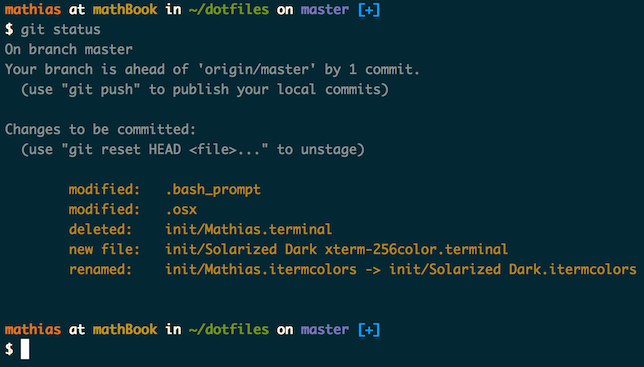 A good example is Bash/Git completion: the dotfiles use a special version from Homebrew. over 2 years Disabling Mission Control animation in Sierra? almost 3 years add npm-debug.log to gitignore? almost 3 years What is the ~/bin/bash symlink used for? about 3 years Use Git's `include` directive? over 3 years How do I change the colours? about 4 years Sym link? Fix bash prompt issue if newline character is removed from PS1. Enable both GNU and OS X `ls` commands to use Solarized colorscheme. Add ability to use symlink. Exports file. Colors in man pages. Keep System Preferences from Interfering. Safari: also disable Java for local domains. Do dotfiles have a file extension? How to use recursive wildcards in fish shell for dotfiles and -folders? How to use Github to manage dotfiles? Manage dotfiles inhibiting hardcoded paths? What's the recommended way to copy multiple dotfiles with yeoman? How do I manage a dotfiles repo when some directories contain git repos? Are all .dotfiles secure from http requests, or only .htaccess/.htpasswd? Avoiding PATH variable conflicts when syncing dotfiles? show dotfiles in textmate 2? Where should dotfiles go in a collection of chef cookbooks? Keep up with changes to dotfiles!